In the summer of 1988 the National Survival Games Rapide was released. As I outlined in the last article, the Rapide featured double action (refered to at the time as Semi Automatic firing), a removable brass lined barrel and a rotating feed with a capacity of 20 balls. Right side of NSG Rapide Hand Tooled Prototype. Purchased from Bob Gurnsey’s collection. To understand the Rapide and why it was a success as an entry level marker, regardless of National Survival Games’ large presence in the game of Paintball, it’s important to look at the arms race up to the beginning of 1988 and the paintguns the Rapide was competing against. May 1988 APG I &I ad for a Gravity Drum Feed before Ammo Box 1 was released. 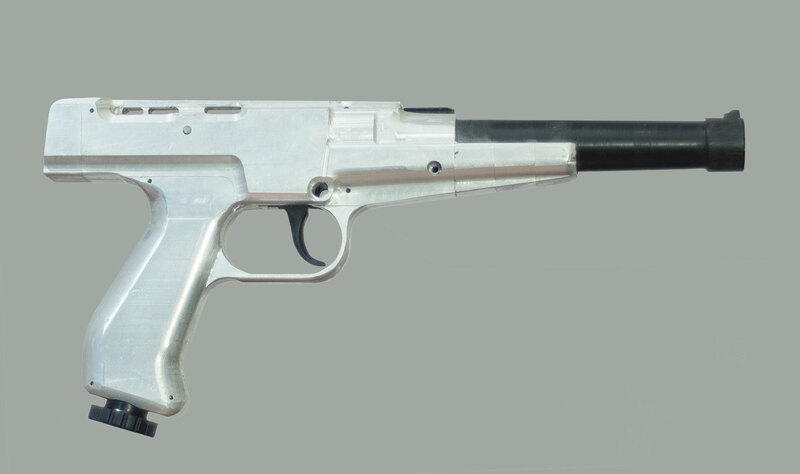 Around 1985-1986, pump handles and stick feeds began taking the place of bolt actions and horizontal feed tubes. Paintguns introduced after 1986 were generally direct feed to be somewhat competitive. Some fields still hadn’t fully accepted constant air so most paintguns were able to be configured for both situations. 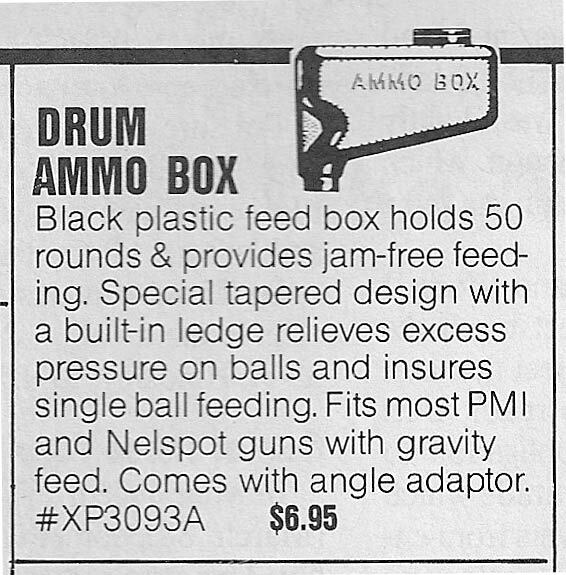 June 1988 APG I & I sport ad for WGP Ammo Box. 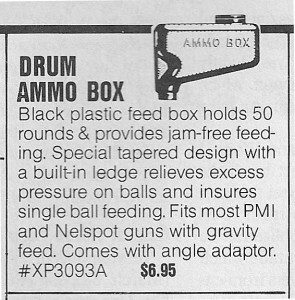 By the end of 1987 homemade hoppers began replacing stick feeds and around May to June 1988, the Worr Game Products Ammo Box began appearing in magazines. Other loaders around this time were home made from oil cans and a few early examples featured rotating cylinders, feeding 10 rd tubes. Bob Fowlie’s prototype, named the Mexican Gatling Gun, is one example of these loaders. Another is the Rain Tree Quick Loader. With the addition of pumps handles, quicker firing rates could be achieved and although not semi automatic, these quick firing pump markers were probably reaching up to 4 to 5 balls per second? And with super quick 12 gram changers (or constant air) coupled with the increased ammo reservoirs of early loaders, these firing rates could be sustained for longer than the 10 shot maximums that players had been used to a couple years before. The Paintball Arms race was in full effect. 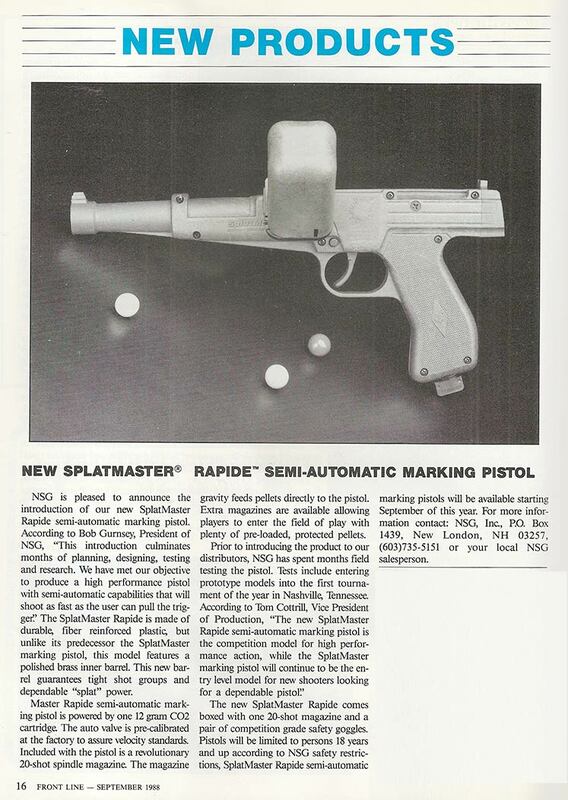 Unfortunately for National Survival Games, their Splatmaster, which had been in production since 1983, was not easily configured for either a pump handle or a bulk loader. 12 grams could be changed quickly with a speed wheel, or a constant air system could be adapted but without a larger capacity loader or quicker recocking mechanism most players probably didn’t bother. The forecasted sales (although I would imagine still strong at the time, c.beginning 1988) for the Splatmasters were probably starting to slow. NSG needed another paintgun that could keep up with the firepower of the PMI Magnum, the early Line SI Bushmaster and the WGP Sniper 1 while being as bullet proof and widely accepted as the Splatmaster. 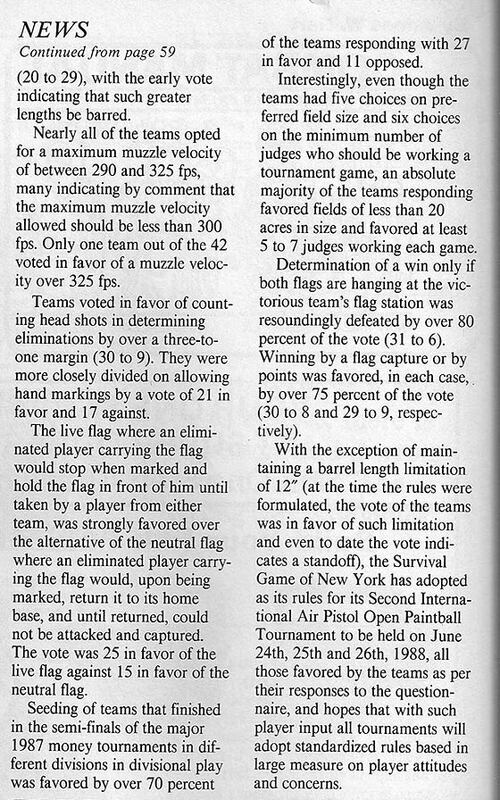 Player opinions from 1988, scanned from the June 1988 issue of Action Pursuit Games. Next portion below. In an article published in Action Pursuit Games June 1988 issue, NSG of New York (Survival New York I believe? ), polled competitive teams to get an idea what the majority of players wanted for tournament play. Second portion of June 1988 SNY player polling. 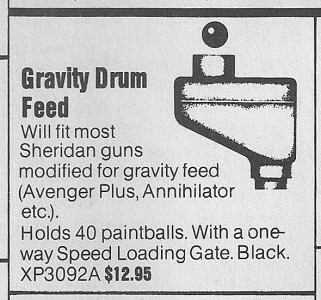 As of late 1987 or early 1988, players did accept direct feed, bulk loaders and a velocity of under 325. But the group of competative players as a whole, had not yet accepted constant air. Barrel length was also not as certain so the shorter length on the Rapide could have been influenced by player opinion at the time (or the longer barrel would just be offer later with the Rapide comp). I’m not sure this survey was in any way associated with the development of the Rapide but the wide amount of teams polled and the strong opinions in most cases were likely the norm for the country at the time. 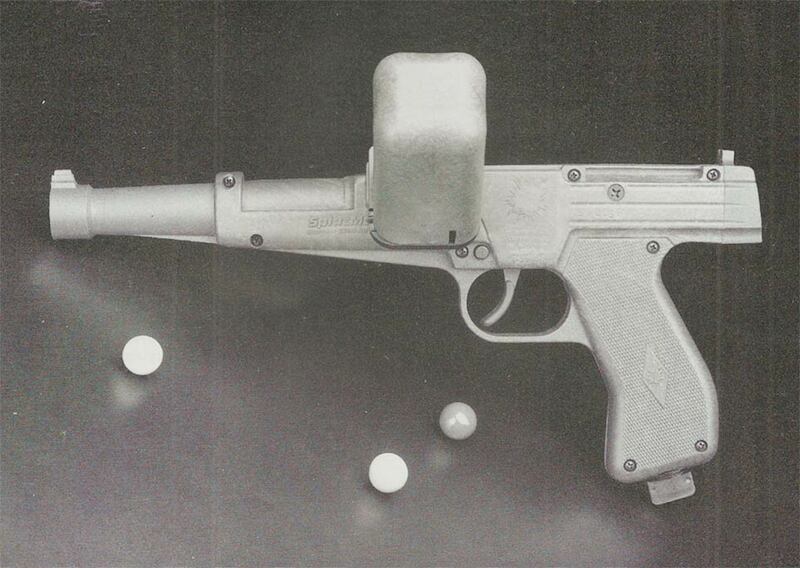 As I mentioned in the last article on the Rapide, double actions in paintball, were not a new idea in paintball since the Adventure Games of America .62 caliber, the Crosman revolver and the Joe Survival Mark V 50 all existed. But these pistols were not widely used (AGA outside of AGA fields, Joe Survival was used basically no where, and the Crosman 50 cal pistols were probably also not popular) and were not 68 caliber. The U.S.A. Crossfire Equalizer, which was .68 caliber was under development but had since faded from radar. 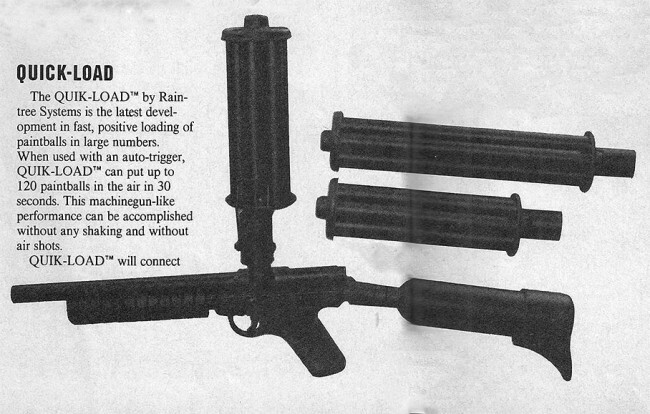 Rain Tree Quick Load Loader, advertised in APG throughout 1988. Scan from October 1988 issue of APG. Text continued below. The gravity feed (direct feed) was accepted and rotating direct feeds were also one of the earliest available loaders. Basically a bundle of tubes that could be changed with one quarter/sixth turn. Second column of text from Raintree Quickloader ad. Scanned from October 1988 issue of APG. 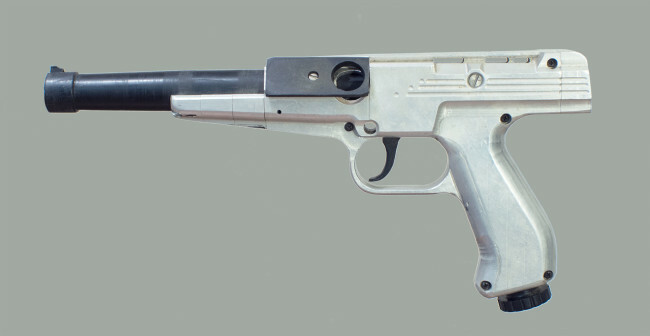 During the time of the Rapide’s release, the only two semis that had been shown in magazines around the summer of 1988 were the AGS rifle and the Brass Eagle Eagle (Semi Nightmare). Each of which had issues, and neither of which was released in a large quantity. New Product write up on the National Survival Games Rapide, scanned from Front Line Magazine, September 1988. Based on these facts, the Rapide likely took over the Splatmasters niche of being an under 100 dollar paintgun that was generally reliable, could take upgrades, could sustain a decent firing rate (even if your trigger finger got a work from the long double action pull) and held more than 10 balls. 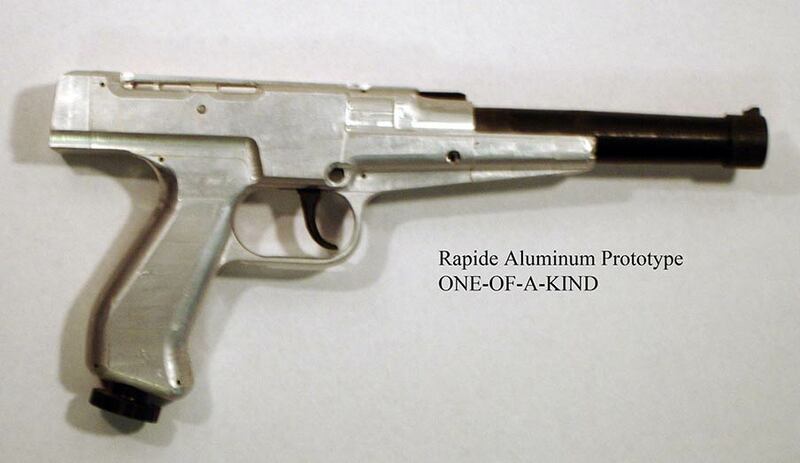 Eventually, with upgrade kits, such as the Adventure Game Supplies Alligator kit and the Comp kit, the Rapide would make used of a dummy co2 to a back bottle adapter, a direct feed, and a longer aluminum barrel. Prototype Rapide, from Bob Gurnsey Collection. Things got busy and Bob decided to hold off on selling his paintguns. Bob contacted me again last year, in 2014, about my interest in his guns and I told him I was still interested. We talked several times about his paintguns, and he ended up selling me this prototype Rapide in February of 2015. Certificate of Authenticity of Rapide Prototype from Bob Gurnsey. Bob explained to me on the phone that Russell Barber was one of the two engineers / prototype machinists employed at National Survival Games in the late 1980s, and along with Clyde Brown were the two machinists behind the Rapide. National Survival Games Hand Tooled Rapide Prototype, left side. Purchased from the collection of Bob Gurnsey. Bob explained that Clyde Brown was the second engineer and I think Bob mentioned he joined when NSG bought Culpepper Plastics Corp (CPC), the plastic manufacturing plant that made the shells. Too bad, since it would be interesting to hear more from them on their inspiration behind the design of the Rapide. Crop of promo photo of the Rapide, from the September 1988 issue of Front Line Magazine. National Survival Games developed this inline semi automatic prototype in 1989 which never came to market and Bob Gurnsey kept in his collection until 2015. Here is a quick video that shows a neoprene cover for a Worr Game Products Ammo Box 1. This cover slipped on from the bottom and might have included a lid. RIP Bob Gurnsey, Paintball’s Creator, and the NSG Rapide. Paintball lost it's creator, Bob Gurnsey, of National Survival Games and father to the industry we all love and creator of the Rapide Double Action. 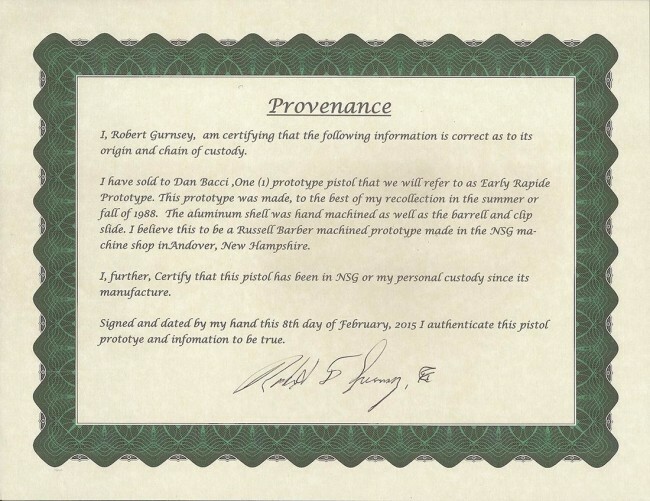 Bob Gurnsey, the creator of Paintball, is opening up his archive of classic National Survival Games items for sale to the public through facebook.